This week sees the conclusions of three of Marvel’s best series of the year, and each book has taken a very different path to its finale: Nighthawk comes to an early end because of its unfortunate cancellation after just six issues, and while it still feels like there are far more stories for the creative team to tell, Nighthawk #6 offers a satisfying conclusion that is just as brutal and pointed as what came before it. The Ultimates started 2016 as the shining jewel in Marvel’s Avengers line, but it took a massive hit with Civil War II thanks to the ongoing character assassination of Carol Danvers and inconsistent artwork. Writer Al Ewing and artist Christian Ward try their best to get the book back on track to set up the new Ultimates 2 series, but the damage done by Civil War II is too much for even their significant talent to repair in The Ultimates #12. The Vision wasn’t cut short like Nighthawk or derailed like The Ultimates. Writer Tom King set out to tell a 12-issue story, and while the success of this series could have kept it going, King’s exclusive contract with DC Comics gave The Vision a set endpoint. Expectations for The Vision’s finale have been extremely high because the book has been teasing the end since the very beginning, and with the rapid escalation of events in the last few issues, it looked like the series was headed for a devastating conclusion. The Vision #12 is certainly tragic, but it’s much more somber than the annihilation Agatha Harkness and Virginia Vision foresaw in their visions of the future after consuming the Everbloom flower. King’s script for this issue is especially neat, with so many references to past events and images that it starts to feel like every moment is a callback to something else. This issue’s cover is a photo album burning in the wreckage of the Visions’ home, so it’s likely that King wants this conclusion to read like a collection of remembrances from the 11 prior issues, but bringing in all those connections to the past gives the book a labored quality. King has clearly put a lot of thought into how all the pieces of this book fit together in the end, but the final puzzle image is assembled with a tidiness that is jarring after so many issues of the Visions discovering the messiness that comes with humanity. The Vision is part of Tom King’s “Trilogy Of Best Intentions” that also includes The Omega Men and The Sheriff Of Babylon, three books that all focus on men whose efforts to do good end up taking them in a different moral direction. The Vision wants to create a family for himself and give his wife and children a happy suburban life like normal humans, but he quickly realizes that family life is far more challenging, especially when the Visions are viewed as outsiders in their community. Through its synthezoid family drama, the book has explored themes of domesticity, xenophobia, race, and the existential crises of adolescence of mid-life adulthood, offering a much more substantial superhero comic experience than the usual Marvel and DC fare. In the Big Issues on The Omega Men #4, I praised King for his treatment of Kalista, a powerful, multi-faceted female character set up as a foil to Kyle Rayner’s doomed ex-girlfriend, Alexandra DeWitt. Gail Simone coined the term “fridging” as a response to Alexandra being murdered and stuffed in Kyle’s refrigerator, and that umbrella term is now commonly used to describe whenever a woman is abused or killed to motivate a male hero. The Omega Men suggested that King would avoid this storytelling tradition in his work with its complex, compassionate portrayals of both Kalista and her teammate Scrapps, but both The Sheriff Of Babylon and The Vision have continued the tradition by sacrificing prominent women. The Sheriff Of Babylon is a painful, powerful read, but the death of Nassir’s wife, Fatima, in issue #6 left a stain on the series. The chapter preceding her death was an intimate nightlong conversation between Fatima and Christopher, the book’s central character, giving Fatima significant character development so readers would care when she was killed off. The reader is in Christopher’s shoes and feels the pain of losing someone they are just starting to know, but the emotional manipulation isn’t subtle at all, making it easy to feel taken advantage of as a reader. Virginia’s death in The Vision #12 isn’t as much of a shock as Fatima’s, largely because she’s been on a self-destructive path since the very start. Virginia sacrifices herself to save her husband’s reputation and ensure the survival of their rapidly diminishing family unit. She confesses to the police that she is responsible for Vision’s recent acts of aggression against his fellow superheroes, and then takes a sip of the corrosive liquid inside the flying water vase of Zenn-La, a callback to the very first issue’s final question of why a vase like that would exist in the first place (answer: it’s suicide décor). King’s farewell letter at the back of the issue dedicates The Vision to his wife, who provided for their family while King pursued his writing career, and Virginia’s story is one of a wife and mother that will do absolutely anything to protect her family, even if it means ultimately sacrificing her life. This issue gives Virginia a fitting end, but taken in the context of King’s other work, which includes the traumatizing of Gotham Girl in the first arc of Batman, it shows that King is keeping the fridge door open instead of slamming it shut. His trilogy of 12-issue series appears to be making a statement about how women are often the casualties of men’s good intentions, but hopefully King’s work won’t rely on this tired device as heavily in the future. So much of The Vision’s emotional impact comes from the work of artist Gabriel Hernandez Walta and colorist Jordie Bellaire, who have made brilliant visual choices to enhance King’s script. Walta’s panel composition has been very subdued on this title; he doesn’t use many dramatic angles, instead presenting most events at eye level with the characters facing the reader. That dominant perspective brings a theatricality to The Vision in that the characters evoke actors on a stage, which ties nicely to the book’s themes of performativity and its references to Shakespeare. Stiffness in the Visions’ body language and their distant expressions also give the impression of toys in a dollhouse, and even though the emotions of these characters are clearly conveyed in their faces, their lack of pupils gives them a haunting hollowness. The printed issue of The Vision #12 came out far too dark, so it’s highly recommended that print readers cash in the free digital code and take a look at the far less muddy digital copy. Bellaire blankets Virginia’s final scene in shadow to reflect Virginia’s dying life force and Vision’s misery over the unavoidable loss of his wife, and while most of the printed pages capture this darkness without having it diminish the linework, that’s not the case with the climactic splash page of Vision holding his dead wife. That’s a pity because a lot of texture is lost in both Walta’s hatching and Bellaire’s coloring, which bring extra weight to that moment by emphasizing the fine details that have made this setting feel real. Mike Del Mundo is one of the best cover artists in the business, and he’s played a key role in making The Vision feel different from other superhero titles with exceptionally clever and evocative cover images. This week’s finale is one of his best, heralding doom while projecting an image of familial love and joy that is far from what readers have seen in this book. 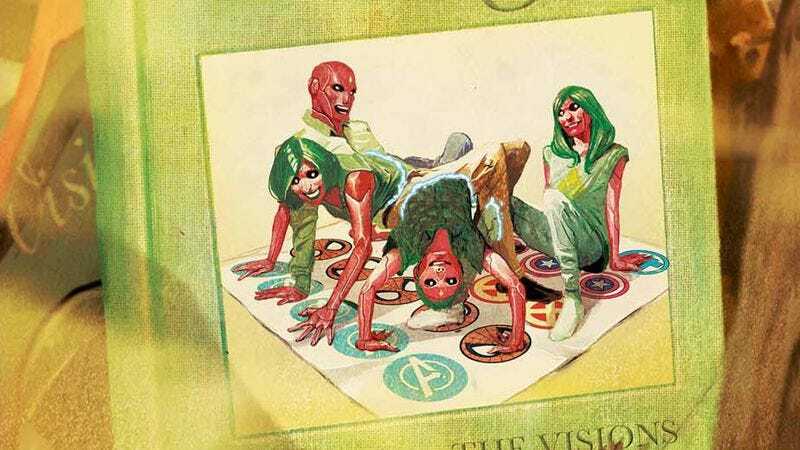 That photo of the Visions phasing through each other during a game of Twister represents the fantasy Vision hoped to have when he created his wife and children, and this creative team has dismantled that fantasy over the course of the series. All is not lost, though. A new, smaller family unit arises from the rubble as Vision takes on the role of single dad to his daughter, Viv, and even Virginia’s end isn’t as concrete as it looks given the finale’s ominous closing moments. The Vision #12 isn’t a perfect conclusion, but that last page is as close to perfect as it gets, showing the Vision as he continues to embrace humanity by making the same mistakes in hopes of returning to a past that never really existed.